There is an elephant in the room, and maybe we should acknowledge it and bring it out into the light. Here it is: we have asked and not received, sought and not found, knocked and heard the door locking from the inside. Haven’t we? And so today we hear Jesus commanding us to keep asking, keep seeking, keep knocking, and we find hope again. We believe again. We ask again. We try to bargain with God like Abraham did. But Jesus has promised us that God wants to give us more than we even know how to ask for. And sometimes it turns out that we were actually asking for a stone, and God gave us fish instead. Suffering. It’s probably the greatest barrier for us in our search for God. Where was God when my dad died last year? We prayed so hard for my sister to be cured, but God didn’t listen. God could have saved all those kids from that car accident, but just didn’t. The search for meaning in our suffering is the elephant in the room. But the Holy Spirit is in the room too, the great and lasting Comforter whom Jesus promises is the reward for all who pray. Keep praying, and watch the Holy Spirit work. Keep seeking, and find the Holy Spirit waiting for you in those dark corners. I will keep knocking until the day the Holy Spirit opens the door to eternity, where every tear will be undone and Jesus, my all-loving Savior, returns to me a hundredfold all the loves I thought I’d lost. Do you feel the Holy Spirit helping you to overcome disappointment and grief? You are so right Kathy, and that elephant’s name is Faith. My priest has said many times that the great irony is that even the Satanist believe in God. They fail in trusting that God The Father Of All, will hear and answer our prayers, and they can’t understand that sometimes the answers are “no.” We do not have His vision, we don’t know what the future holds, and sometimes “no” is the merciful answer. We however need never fear going to Him with whatever burdens our hearts. And guess what, no matter how awful it may seem, He is the One Who can understand it all. 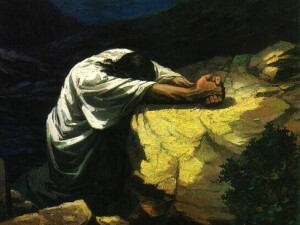 The Lord’s Prayer was the first prayer I said over and over again, as I was coming back to this Faith. I even got it on a poster and framed it, to remind me to say it and think about what it means. I like the different wording from “lead not us into temptation” to “put us not to the test.” I guess if we knock at the Lord’s door and ask Him for the tools we need to face the test of daily life, we can face about anything. I have learned that God doesn’t need me to pray to strenghten Himself, He asks me to pray to strenghten myself. It’s funny how we get things backwards, we think God depends on us for worship, Like He would disappear if no one prayed, All the things He asks us to do or not do, are not for His benefit but for our’s. I wonder how many other people have thought that way? Our power is in the faith we have in God, His Power is Eternal and dependent on no one and nothing. He is Father! The Holy Spirit is at work in your reflection this week. Without knowing, you have written exactly what I needed to hear. You see, this week has been a struggle of faith for me. On Monday we learned that a Christian pastor and his brother, also a Christian, with whom we were working with in Pakistan to begin an orphanage for Christian children was martryed on the steps of a court house in Faislabad, Pakistan after they had been found innocent of blasphemy charges. From the time of their arrest 2 weeks earlier, the suffering in the city for Christians there has been increasing with more rioting and calls for killing Christians played over mosque loud speakers. Horrifying really. Just days before his arrest, Pastor Rashid had been refused a visa for a planned visit to the USA for a church conference. He wrote, “I do not understand why they have refused my visa. I believe that God must have more important work for me to do here in Pakistan.” 16 days later he laid dead on the steps of the court house. Since Monday, I have struggled greatly with the “whys”, with trying to understand the meaning of the suffering and death. With the loss of someone who was living the Gospel where it simply isn’t safe to do so. And here..here are your words reflecting on the very Scripture that I needed to hear. So God’s answer is that I need to keep on keepin’ on. Sometimes when we struggle with the meaning in the suffering, the point is to know that He is right there with us. So I’ll continue to pray, to ask, to knock and always to seek Him first…through the tears, the doubt, and the anger. As Becky wrote…I will continue to trust that God is hearing all that I am sharing with Him (and he continues to love me despite the struggle). Thank you for sharing your reflection. It’s touched me deeper than you can know. Becky wrote that sometimes the answer to prayer is “no.” I believe that sometimes the answer we hear is “no,” but it is really “yes,” which is another version of Becky’s perspective. The year after I graduated from the CBS, my prayer partner died of cancer. She had been to Lourdes a few months after we graduated, and God granted her prayer for healing in the best way possible — He healed her with the ultimate healing for which we all hope. God graced me to see this, and when my son died two-and-a-half years later, I was able to see the eternal blessing he had been granted. Only God knows what his life here would have been like had he survived the radiation and chemotherapy required for his bone marrow transplant, which was not successful after all. I am grateful for the gift of faith, because without it, I would not have been able to to on, either. I agree with everyone, that God does answer all our prayers, sometimes it is not what we prayed for. 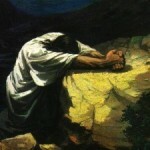 How do we reconcile our heartbreak and our prayer life? Within the last two years I lost two people whom I loved dearly, my father and my brother. I prayed for a peaceful death for my father. I prayed that my brother would be cured of his cancer. My father did have a peaceful death. My brother also passed away. I know that God was with me during both of those hearbreaking moments. My faith tells me that we are not meant for this world. I know that my family members are experiencing eternal joy and peace. I pray for them and ask them to pray for me. Their time here on earth is over,they both taught me how to live and how to die, they are alive in my heart. I think about our Blessed Mother, who watched her son suffer and die, he who was without sin. Her heart was truly pierced with a sword. My faith tells me that God does answer our prayers. Kathy, I agree with “mamidecinco”; the Holy Spirit is especially present and at work in your words this week. How hopeful and full of faith yours and everyone’s comments are so far. The losses expressed are beyond my imagination, but the faith is so alive right along with them. Thanks to everyone who has shared so far for that encouragement. I lose focus with my prayers. It’s not that I give up; it’s that I’m scattered and forget to keep asking. Sometimes before I know it discouragement sets in. But I think that to keep asking, and not to expect an answer the way we want it, is a way of loving God. He loves us so much; here is an opportunity to do something loving for God. If I ask a friend whom I love for something, and the friend has to take time to answer me, how could I pout around and turn away from my friend? I think just to KNOW God is there, no matter how He answers, strengthens my connection with Him. Thanks for a place to make these readings more alive in our lives. It is warming to my heart and soul to see the Holy Spirit so alive in the writings here. I may only echo some of what has been said, but here is my brief thought. … For everyone who asks, receives” God does make the promise that we will receive, but He does _not_ promise that we will receive what we ask for. God gives us what He knows we need, as the good Father that he is to us. Thank you all for your willingness to share. It touches me deeply. How inspiring – and how comforting – it is to read Kathy’s reflection and everyone’s beautiful comments on the site this week. The witness of your faith is overwhelming, the courage to face suffering in the sure knowledge that God is there. My deepest pain is born from the struggle to find a home in the church in which I was formed, to embrace a path that nourishes my great love of the church’s liturgy and theology. I don’t have that now for a lot of reasons, but I will not stop asking God for that grace. I believe this site is part of God’s answer to my prayer. To know that the weekly readings can bear such fruit in people of faith who hear the Word and let it grow within them gives me hope, and assures me that the Spirit is present in the words that are written here. So thank you for sharing, for letting the words from your heart be a witness and an encouragement. For making a home where I can belong. A friend of mine died 3 days ago at age 59. He left for the Tennis court the same day his wife left for an out of town trip to be with the daughter who was to go shopping for a bridal gown. While playing under the hotter than normal sun, he collapsed, struck by a massive heart attack. Wife had to be paged throughout the department store by a doctor who broke the news gently. His written word and in the way His children receive it. I use to worry that so many different interpretations, would diminish the true meaning to Scripture and would be somewhat sacrilegious. After reviewing my journey and the sharing in these last few weeks I don’t feel that way anymore. Thanks again my Dear Kathy for this chance to learn, hear and share the many gifts of our Lord. Love You!! Wow–my comments seem to pale in comparison to some I’ve read. The depth of feeling and vulnerability in these posts is truly a gift. Two thoughts after reading Kathy’s initial reflection. 1. Sometimes we ask for “good” things and God says no because He wants to give us “great” things. For years, I prayer for a husband, and in some ways it was a very lonely time. Aren’t I lovable? Why can’t this man love me that way I want to be loved? And God’s answer, now, is so clear–that men I may have dated in the past were good, good men, He wouldn’t let me settle for good, when “great” was waiting for me in Paul. I know the vocabulary might need to be tweaked when we think about a faithful man martyred in a far away country with more headlines than we care to read–maybe that was the “great” that God had planned for his life. Cris’ “silent sacrament of God” in ministering to his widowed friend, was the “great” act of love. The continuing search provides blessings in ways that a definite answer might not. He can settle any sea, but it doesn’t mean He will. Sometimes He holds us close and lets the wind and waves go wild. Maybe the promise of finding, being answered, and having the door opened, is really just the promise that when the waves get bigger, the arms of our Savior will be there to hold us. I have nothing I wanted to add today other than letting you know that I visited. When Christ said to go into a closet to pray; not to make a great show of speaking to God…I think this is because there is no more intimate connection in a relationship than being alone and speaking of all that is in one’s heart. Prayer has taken many forms for me. As a child, prayer was about asking for something. As a young adult, prayer was about asking for something! I was harnessed to the idea that something magical would occur and what I was asking for was really going to materialize. In a frenzy of “why isn’t God giving me what I’m asking for?”, I was told by two of my Southern Baptist friends, “you are not saying the right prayers.” Years went by…wondering what particular words I needed to say so that God would rescue me. I began to read some books about Buddhism. I love the book that combined the efforts of Vietnamese monk, Thich Nhat Hanh and Father Thomas Merton…LIVING BUDDHA, LIVING CHRIST. I explored more books by this wonderful monk, who keeps ideas simple and direct. The RELIEF that I began to feel,knowing that God is not micro-managing my life; that God is not doling out or withholding “things” based upon “how” I pray. The sense of freedom that I began to have…. understanding that I am blessed with LIFE! I am capable of making decisions. Prayer, for me, is rather like going to a very close friend…someone to open my heart to; and, often from whom I don’t require a response….just to know that I am heard. As I share my thoughts, sometimes my fears, doubts, heartache, with God; I am inspired to be myself! I am safe to talk things out; to know that I’ve been heard; to know that somewhere, somehow I really will have the courage and strength to get through another day. When I pray for others; I ask for peace of mind, courage, strength. I cannot presume to ask for more. HOW do I know that I have been heard, and that I am heard. As I step away from myself to reflect on the past and even the events of this day…I am in AWE of so many things that I survived both physically and mentally;of the joy that unexpectedly fills my heart and yet has no feasible explanation. I know that I am not “walking” alone. MichaelCarlos….blessings on you as you search for what your heart needs and requires. What a gift this website is! It allows the stories to breathe long after we’ve left the church. I am going to tell everybody about this site because I want to see what happens when the sacred conversations take place around the country and around the world. Becky Wolfe wrote, “I use to worry that so many different interpretations, would diminish the true meaning to Scripture and would be somewhat sacrilegious.” I think the Church has worried about that in the past, but anyone who understands classic literature knows that it touches people in their particular circumstances. That’s what makes it CLASSIC literature! I am reading all your comments and I am crying. The Holy Spirit is so alive in all your stories. Our Lord tells us to trust in Him. I love all your comments. I am struggling with my son who has no job. But all your stories give me hope! I know Jesus loves me and you. Kathy, I love this web site what a blessing it is. Jesus we trust in you. Love you all. But there’s that question of why stop at ten? I am reminded that in the process of prayer, dialoguing with God or simply sitting in the stillness where the Holy Spirit speaks, I find that sometimes my prayer changes. I come to a place of knowing that what I have prayed for is not going to happen the way that I want. When my dad was dying of esophageal cancer, I prayed for a miracle and healing of all kinds. I reached out in ways that I never prayed before. The signs were all there. He was not going to get better. Then I prayed for his peaceful death and my being able to let go. So where was the Holy Spirit in all that? Probably leading me to the prayer of letting go and surrender, a prayer that I did not want to pray in the beginning. It was a time of recognizing that God was in control and that I could not manipulate God or make this pain go away. I guess both Abraham and I yielded, put down our arms and shields of thinking that we knew what was best. Even though Abraham stopped at 10 and I began to pray differently, I think the most important thing that happened was the relationship, the conversation with God, the boldness that tells God, “This is what I need…want…” and the willingness to let the Spirit’s promptings move me to another prayer.